Samseong Station is a station on the Seoul Subway Line 2. It serves the eastern area of Teheranno. Some of the more famous buildings near the station include World Trade Center Seoul, COEX Mall, Korea Electric Power (KEPCO) headquarters, Korea Air City Terminal (buses run from here to Incheon and Gimpo Airports, and vice versa), and Gangnam main police and fire stations. 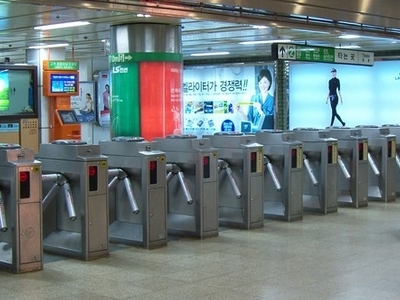 The ridership of this station is very high, consistently ranking among the five most heavily used subway stations in Korea. The table below shows the average daily ridership of recent 3 years (2013 will be uploaded at the end of this year). The name of this station sounds like Samsung, but there is no relation between the two. The 836-meter (914-yard) section of sidewalk along Yeongdong Boulevard from exit No.5 of this station, outside COEX Convention & Exhibition Center and ASEM Tower is designated as a smoke-free zone by the Seoul Metropolitan Government. Here's the our members favorite photos of "Metro Stations near Gangnam". Upload your photo of Samseong Station!